Use this thank you letter example if you received a job offer from a company to say thank you. You should amend this letter before sending it to the employers. I would like to take the opportunity to thank you for the job offer to work at as . Once we had the chance to talk, I became even more excited at the prospect of joining your team. As you know, I have some loose ends to wrap up as I am in the process of relocating. However, I am quite confident that I will be able to begin the new job on the date we discussed . I would appreciate it if you would contact me if you need to discuss my future employment. You have all of my current contact information. The best way to get ahold of me is via my mobile number. 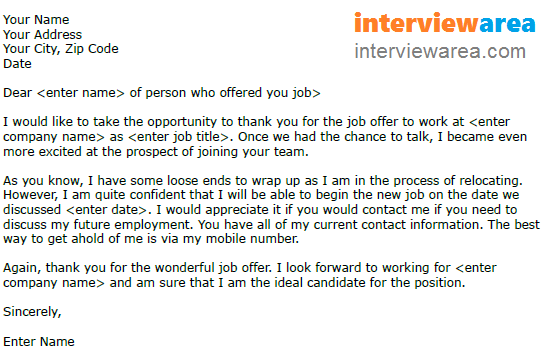 Again, thank you for the wonderful job offer. I look forward to working for and am sure that I am the ideal candidate for the position.